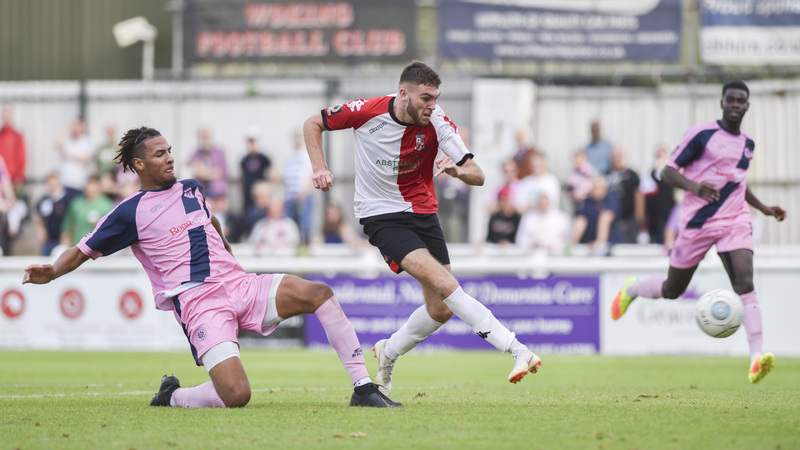 Woking were caught out at Kingfield by a Dulwich Hamlet side full of speed and endeavour to lose at home for the first time this season. Michael Chambers took advantage of a lacklustre start by the Cards with a looping header. Though debutant Harvey Bradbury was able to equalise in the second half for the home side, Dulwich substitute Iffy Allen sealed the victory with an impressive solo goal. However results elsewhere have been comparatively kind to the Cards and they still hold a two point lead at the top of the National League South table. On a bright and mild autumnal afternoon manager Alan Dowson looked to return to winning ways having conceding late at Concord Rangers to deny a victory last week. He welcomed new loan signing Bradbury from Oxford United into his squad and opted to include him in his starting line up as a lone striker in place of Greg Luer. Daniel Spence replaced Josh Casey in one other change from the last outing. Woking kicked off the first half and attacked the MKJ end. Some late arrivals in the stands had barely taken their places when the visitors made their first attack count. A corner was floated in by Nash, helped along in the penalty area by Ferguson and headed down by Chambers. The force of the bounce eluded Schotterl and sensing the danger too late Spence was unable to prevent the ball from crossing the goal line. The visiting Dulwich fans celebrated the early lead as the Cards looked to gather themselves and get back into the game quickly. Their first attempt at restoring parity came with a corner which Kretzschmar played short and backwards to Little waiting on the point. He connected with a fierce low shot which was deflected wide. A second corner resulted, this time hit long to Wheeler who chose to cross back over the waiting pack. Kretzschmar arrived late and narrowly failed to get his foot on the ball for a simple tap in. Jay May appeared to get the better of a tussle with Jack Cook, giving himself a clear path at goal. However just as he lined up his shot on the Cards goal, the linesman belatedly raised his flag to indicate a foul, much to the relief of Cook and the rest of the Woking backline. Moments later Woking won a corner. Wheeler crossed it long to Little whose shot was deflected out to the right. Kretzschmar collected and looped a high ball through to the back post. Edwards was able to collect first despite coming under heavy pressure from Bradbury. The visitors against tested the Cards when Cook fed Vose on the left. Before Woking could get back into position he hit a low cross-shot diagonally across goal which eluded Schotterl. However May was unable to arrive in time to redirect the ball before it had sailed narrowly wide of the far post. Woking’s best chance of the half came in the 36th minute. After winning a heavy challenge Cook spotted Bradbury advancing and played a perfectly weighted pass over the top of the backline. Bradbury collected the ball with aplomb and with just the keeper to beat got under it far too heavily to lift his attempt over the crossbar. Moments later Woking had another opportunity to beat Edwards one on one; Bradbury played Ferdinand through and he beat the offside-trap, attempting to stroke it past the advancing Edwards; the effort gently rolled the wrong side of the far post. One final opportunity in the first half fell to the Cards. This time it was Hodges who was sent clean through. Again Edwards was quick to respond and cut down the angles. Hodges opted to shoot early past the onrushing goalkeeper and watched as another home effort sailed wide of the goalframe. Alan Dowson opted to make a change at half-time with Ian Gayle brought on to replace Kiran Khinda-John. The first action of note in the second half saw an early Woking effort cleared by the Dulwich defence with such ferocity that it shattered a drainage pipe running along the Main Stand. Perhaps this was a sign of the intensity that the visitors had brought into the game with them. Cook brought the ball forward out of the Woking half and switched the ball through to Spence. Having looked ahead he found Little who found the time to switch onto his left foot and hit a powerful shot. Though Edwards was instantly beaten the attempt rebounded back off the far post and was cleared to safety by the Dulwich defence. The visitors continued to pose a severe danger and regularly looked to play in amongst the Woking backline. Returning former Card Anthony Cook engineered some tricky footwork to get past the midfield and clip a ball through to substitute Clunis who found himself clear on goal. Schotterl read the move instantly and bolted out of his penalty area to clear the danger before the shot could be taken. In the 70th minute Dulwich again pushed forward on the attack. Ming fed Clunis with other teammates in support. His effort beats Schotterl but was well tracked by Collier to intercept on the goal line and deny a certain goal. His clearance was fed through to Bradbury who found himself clear again with Dulwich’s numbers in defence short. This time he composed himself well and coolly placed the ball past Edwards to equalise, much to the delight of the Cards fans seated behind in the Leslie Gosden Stand. Having conceded first but then having gone on it to win in every home game so far this season Woking would have expected to have pushed on for the go-ahead goal yet again. However it was the visitors on this occasion that showed the greater fight in the closing stages and surged forward for the game winning goal. A wonderful piece of individual skill from substitute Iffy Allen proved the home side’s doing. He collected the ball just inside Woking’s half and twisted and turned his way forward as the home defence backed away. Once he was near the edge of the penalty area he saw a tiny part of the back post and hit an exquisite low shot across goal through traffic which beat Schotterl and nestled into the goal via the back post. Woking endeavoured to try to equalise again in the dying minutes. Kretzschmar crossed for Cook to nod down in a dangerous position. Substitute Jake Hyde swivelled to get a shot on but he couldn’t get enough control to keep his attempt down. The final effort of the match saw Hodges feed Hyde who was able to shoot quickly before Edwards could position himself. The attempt ricocheted off a defender for a corner. The resulting phase was cleared out to Little who shot back across goal but he was unable to trouble the goalkeeper allowing the visitors to claim a hard fought victory at Kingfield. Having now lost their perfect home league record Woking now take a break from National League South action to focus on qualification to the FA Cup. The begin in the second qualification round next Saturday at home to Tooting and Mitcham, ironically the team that ground shares with today’s opponents. The Cards will hope for a better outcome on that occasion. Sponsors’ Man of the Match: Harvey Bradbury. Held the forward line well to cap off a successful debut. Harvey learned from his earlier miss when one on one to equalise midway through the second half when in similar circumstances.